This semester, I have been working on my first manuscript from my research with Mexican Jumping beans. The paper will be focus on the variation amongst individual bean behaviors. This past weekend though, I took a break from my first draft to take part in the largest student-run philanthropy event in the world, THON! For those who don’t know, THON is a yearlong effort to raise money for the Four Diamonds Fund, which assists pediatric cancer patients at the Penn State Hershey Medical Hospital. 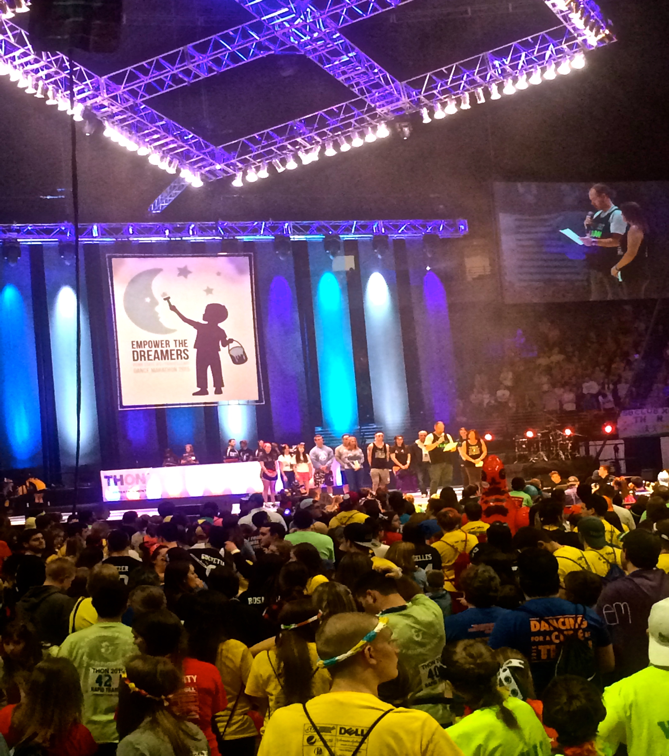 It is a 46 hour dance marathon for the kids and their families to forget about the illness for one weekend of games, performances, and fun with a supportive Penn State student family. The whole event takes place in the Bryce Jordan Center, with the dancers on the floor and everyone else cheering them on in the stands. 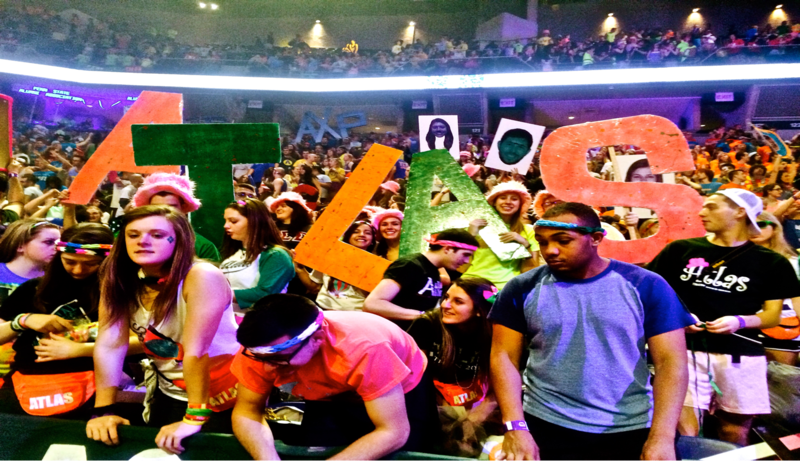 I take part in Atlas, which is a special interest group organized solely for the purpose of raising funds for THON. We had 10 dancers on the floor this year, and a huge group of Atlas members supporting them from the bleachers. Make them real, BE EMPOWERED. I stood in the bleachers from Friday afternoon until midnight, and then I went back to my apartment to sleep while the dancers danced on. Saturday afternoon I excitedly went back and stood 25 hours until the very end Sunday afternoon. 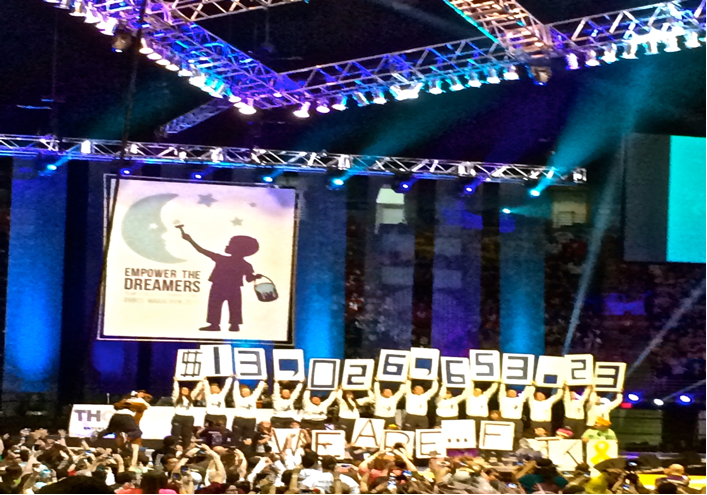 At the end of those 46 hours, the grand total raised by everyone was revealed: a whopping 13 million! I am so proud to be a Penn State student because of this extremely worthy cause. 13 million dollars will go towards cancer research, providing care to pediatric cancer patients, and paying for treatment not covered by insurance. I am very fortunate to be a part of such an amazing student body at such a prestigious research university. WE ARE… PENN STATE! 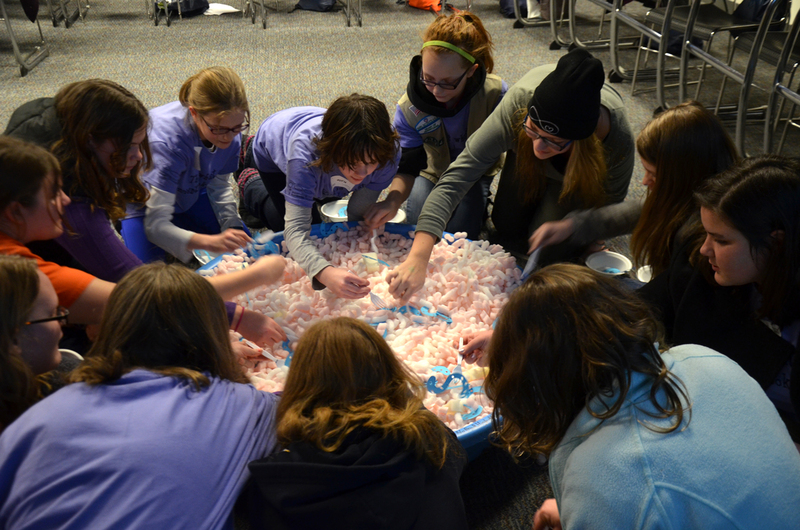 Categories: Education and Outreach, Just For Fun | Tags: philanthropy, thon, Undergrad Research | Permalink. Scientific information is important for making informed decisions about subjects such as health, technology, and the environment. In many countries, lots of scientific work is funded with taxpayer money, so it’s scientists’ jobs to communicate that back to the sponsors of their work. Science is fun and cool, and we’d like to inspire more people to be interested in it. Outreach is a way of accomplishing these goals. It’s just the process of communicating science to non-scientists in understandable and relatable ways. Outreach takes many forms: small classes, visits to schools, newspaper or magazine articles, and one-on-one interactions. For herpetologists, outreach often happens at the times you might least expect; for instance when you happen to be tromping around a National Forest looking for lizards and a big dude holding a shotgun and wearing camo walks out from behind a tree and asks what you are doing. When this happens to me, I first focus on keeping my cool (out of long experience at this point) and then happily explain what I’m working on. Almost everyone I meet is interested in hearing about science if I can approach things in the right way. Science, is often inherently interesting, or may be connected to things people care about (like health) or that they have a general interest in (what the heck are those lizards I see all the time?). Most of these interactions are positive for both the scientist and the public. I may edge the hunter with the shotgun towards the opinion that maybe all rattlesnakes aren’t impending threats, or he might clue me in to a site chock full of fence lizards that would make a great study site. In addition to these types of interactions, technology has provided many new ways to reach out to audiences including blogs, social media sites, videos on Youtube, online classes, etc. Whether old school or cutting edge, I believe that outreach is an integral part of science (If you publish a paper and no one reads it, did your research matter?). It’s also usually quite fun and gratifying to talk to different people and discuss things that you are enthusiastic about. In this post (and a subsequent one by Gail), we’ll be discussing some of the ways that members of the Langkilde Lab have been conducting outreach and are looking to continue in the future! One of the easiest ways for a young scientist to get on the outreach bandwagon is to work with people who are already doing it. 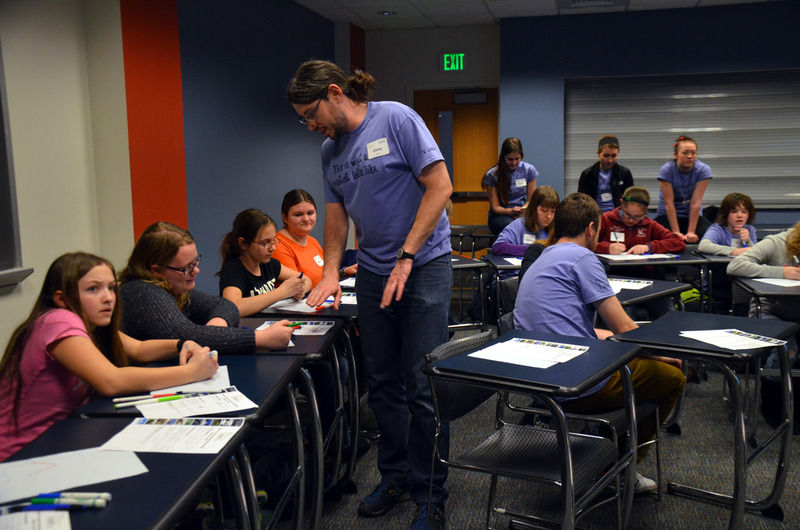 Here at Penn State, the Eberly College of Science has a whole office devoted to scientific outreach that sets up community activities, after school programs, and summer science camps. I’ve worked with various grad students in the Biology Department to give programs at many of these events and design and implement new programs for others. Every spring and fall, we participate in Exploration U, a sort of science fair for students at local high schools that involves many Penn State researchers, labs, and student groups giving presentations based around their research. 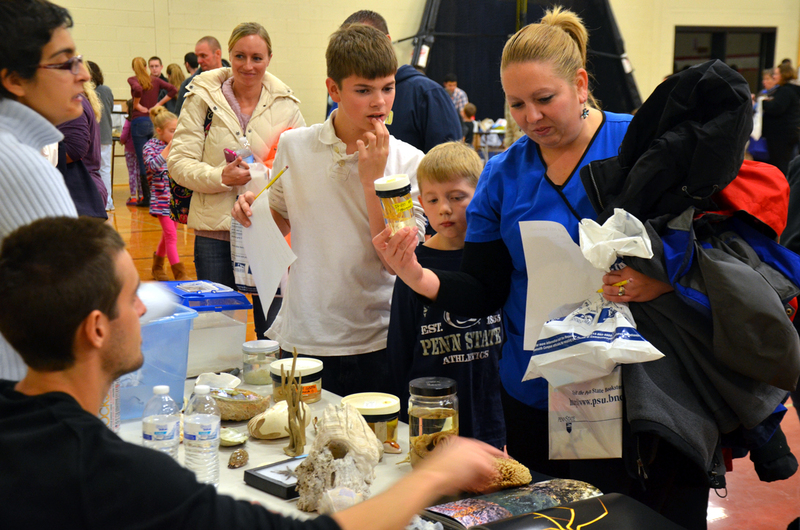 Penn State Biology grad students showing off some marine specimens at an Exploration U event. Obviously the cuter one is on the right. These things are big (ours, Vanilla Iceopod, is over a foot long), closely related to the roly-polys (or woodlice) in your backyard, and really weird lookin’. I picked up the Tupperware with our preserved specimen, sat on the floor in front of our table, and called out “Who wants to see what I’ve got in this box?” in my best carnival barker voice. Welp, it turns out that kids love a good freak show, and I was happy to oblige. In the 2.5 years since, Vanilla Iceopod has become a staple of our Exploration U setup (click though pics to see yours truly). 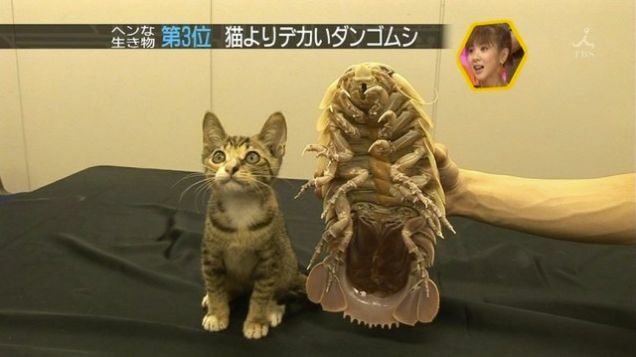 I’ve received all kinds of questions about Giant Isopods, and, as a result, have actually had to read about them and looked up lots of weird facts in the process (Best question: Can you eat them? Answer: Yes, apparently in some Asian island/coastal communities they are considered a delicacy). Explaining how isopods use folded rami for breathing in deep sea environments. So some of outreach may just be getting people in the door with a little flash or sizzle. But, in addition, we want to move beyond the perception of science as just a collection of cool facts and occasional explosions; we need a focus on some core ideas that we want to convey. As such, we’ve also worked to design custom programs for local groups, including after school science classes and the Expanding Your Horizons STEM fairs for middle school girls. We’ve created activities showing how different adaptations are favored in different environments, and how changes in those environments then lead to natural selection on organisms. One of these activities involves students acting as organisms with different feeding structures (plastic utensils) and seeing how many of different prey items (ping pong balls or paper worms) they could catch. With a limited food supply, some feeding structures were more favored than others depending on the prey, and if students weren’t able to secure enough food, their organism perished. Students gaining lots of food were able to reproduce (have another student share the same utensil), and passed their feeding adaptation on, emphasizing how certain adaptations can spread over generations. These forms of outreach can combine fun activities with real scientific ideas and provide a solid scientific background while also conveying the familiar “science is cool” message. EYH participants as Spoonasauruses, Knifeopotamuses, and Forkadons seeing who can “eat” the most pongberries and paperworms. Discussing the suitability of different feeding mechanisms in different environments during our Expanding Your Horizons activity. 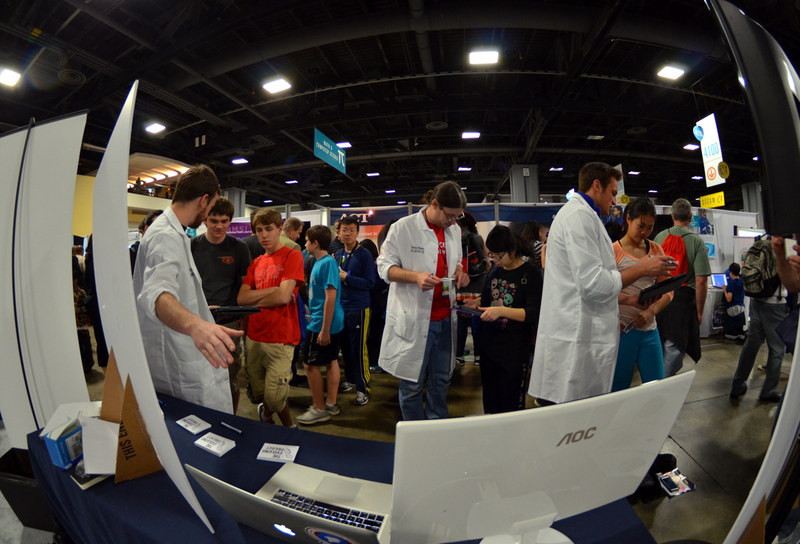 This past Spring, I also had a chance to take the outreach show on the road by working at the USA Science and Engineering Festival in Washington, D.C. This festival was HUGE, with over 325,000 people visiting over four days in an enormous convention center…>2,300,000 ft2! As part of a group of six Biology graduate students, I helped design and present an activity that used iPads to look into how small variations in organisms can lead to larger changes over time. 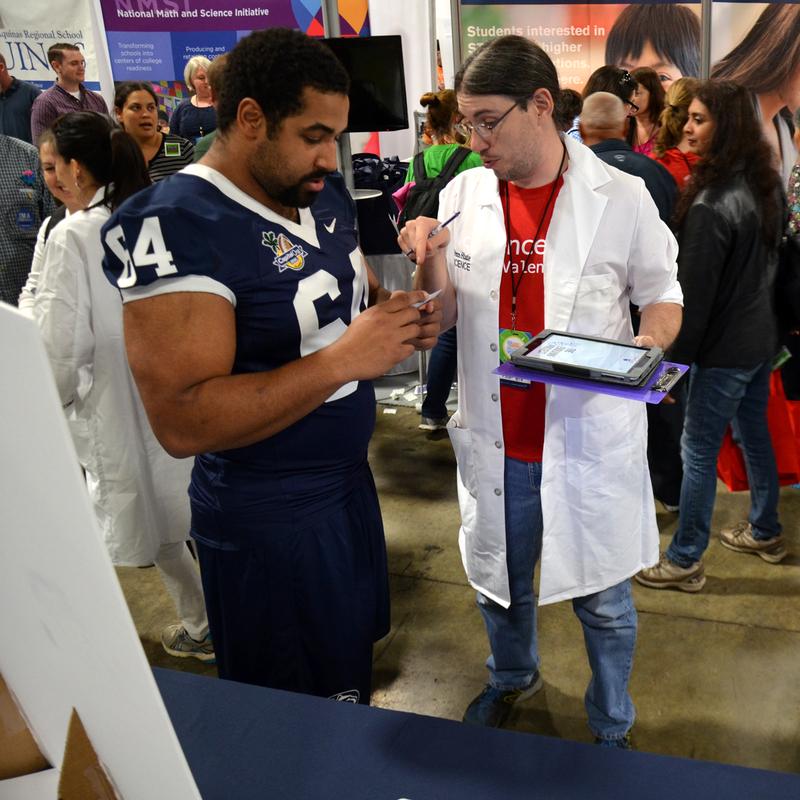 This activity used a custom iPad app programmed by Bio grad student Zach Fuller, and was very popular: we reached over 1,500 people during the course of the festival and had lots of great conversations. The crowd gathered to participate in our activity at the USA Science and Engineering Festival. Notice our spiffy lab coats signalling what a high class outreach team we are. My next big outreach project will (hopefully) come to fruition this fall. Along with Zach and Allison Lewis, two Bio grad students, I’m designing a class for undergraduate and grad students in Scientific Outreach and Communication. We’re working to build this class from the ground up, and are currently filling out all the paperwork, jumping through various hoops, and lining up guest speakers and activities for this class. It’s a great experience so far in being a teacher and going through all of the preparations necessary to design a new class, but I’m really excited to finally have the opportunity to teach independently! It’s even more exciting because the topic is something that I am passionate about. The class is going to be centered on working with students to design their own outreach activities based around their research and then conducting those activities throughout the semester. In addition, the administration in the College of Science is quite excited about this, because expanding outreach is part of their strategic plan. If all goes well, we’ll set up a continuing class that can be offered each year to support Penn State students learning how to present their research to many different types of audiences in lots of engaging ways. In our next post, Gail will describe some of her exciting outreach experiences as well! 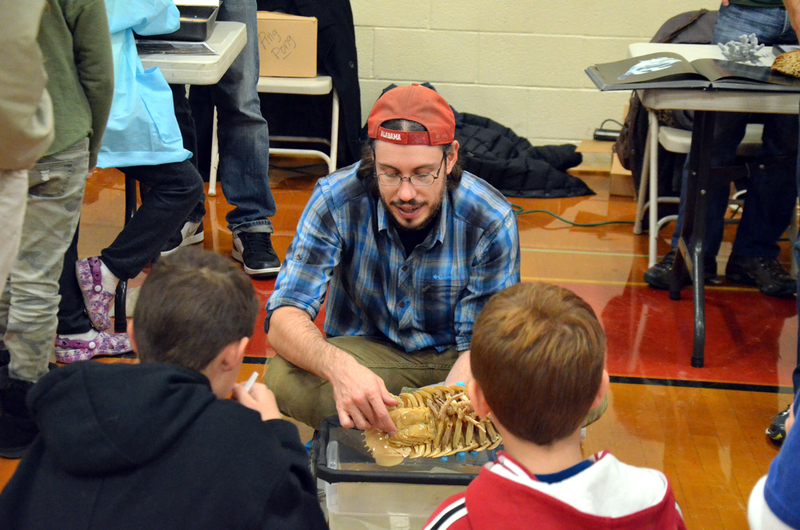 Categories: Education and Outreach | Tags: education, giant isopod, isopod, outreach, science outreach, STEM | Permalink.